EPA Verified Technology to reduce overspray and spray a flawless tan. At SUNLESS RX we are all about top offering quality cutting edge equipment made for professional salon use. Our system is the only patented sunless application tested to give consistent, accurate results. The patented connect the dots laser guide assures that you are at the proper distance from your client. 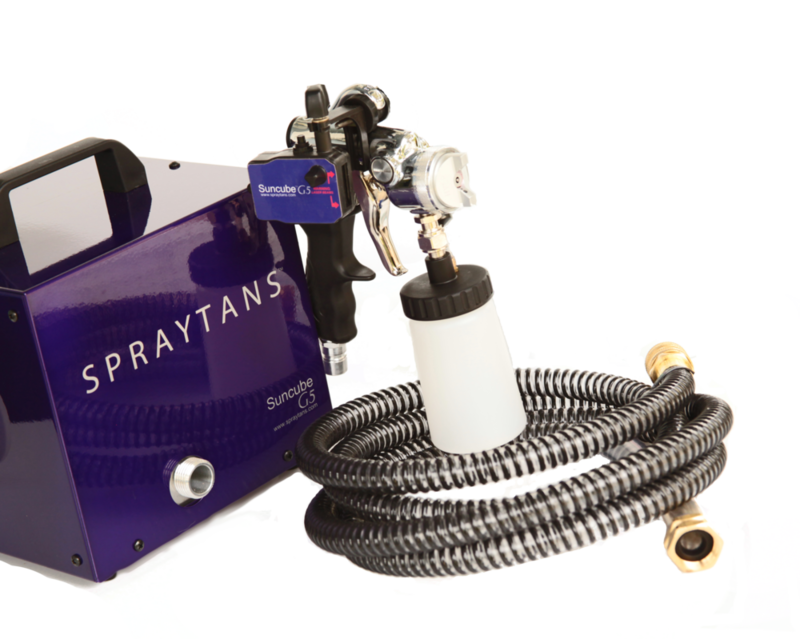 Our laser guide virtually eliminates overspray and will guarantee that you have no drips, runs or missed areas. Competence is essential if you desire to be the best spray tan artist and our system gives you that with every application on every customer. It is the only spray gun the United States Environmental Protection Agency has certified using the laser guide system to improve both accuracy and reduce over-spray. Combine that with our HVLP quiet warm-air turbine and you have a flawless professional HVLP system that is simple to use and quick to learn. The laser guide & HVLP SUNCUBE turbine are made in the USA. Made in USA (CA Prop 65 certified) with no harsh or cancer causing ingredients. We are Peta® registered, free from any animal products or testing. Much of SUNLESS RX™ success is due to resourcing more purified sources of DHA and refinements in our new high tech manufacturing process. SUNLESS RX™ has developed a unique mix of two select DHA types. The color change now takes only two hours to begin appearing on your skins surface and will continue to darken for up to twelve hours. SUNLESS RX will eliminate your need to purchase three or four airbrush solutions with different percentages of DHA solution for a light, medium, or dark result. Make your service simple and profitable. Sunless tanning spray products are best formulated at a pH of 4 to 5 which allows for maximum stability and shelf-life. A new perfluoropolyether phosphate has also just been developed which allows for a lower pH for the sunless spray solution without any skin irritation. We always formulate with no harsh chemicals, parabens, or cancer causing ingredients. All our products are manufactured in California and are certified to be proposition 65 compliant. All SUNLESS RX™ products are approved for export to Canada and Europe. We offer many professional training options both at your location or live one-on-one video conferencing via "Facetime"